Scientific category is one of the astonishing topics that always amaze us. And now scientists have created a substance better to say a self-healing material that is a stretchy self-healing electronic skin. As mentions interestingengineering.com the researchers who realized the study are inspired by Jellyfish. At first the self-healing material has swelled when wet and shrunk when dry, this exclusive substance can preserve its shape in both wet and dry surroundings and work effectively in sea water and even in acidic or alkaline environments. “We wondered how we could make an artificial material that could mimic the water-resistant nature of jellyfishes and yet also be touch-sensitive,” said Benjamin Tee, lead researcher on the study, in a press release. The team of scientists led by Assistant Professor Benjamin Tee spent a year to create the material in collaboration with Tsinghua University and the University of California Riverside. Assistant Professor Benjamin Tee was one of the teams that developed the first self-healing skin back in 2012. 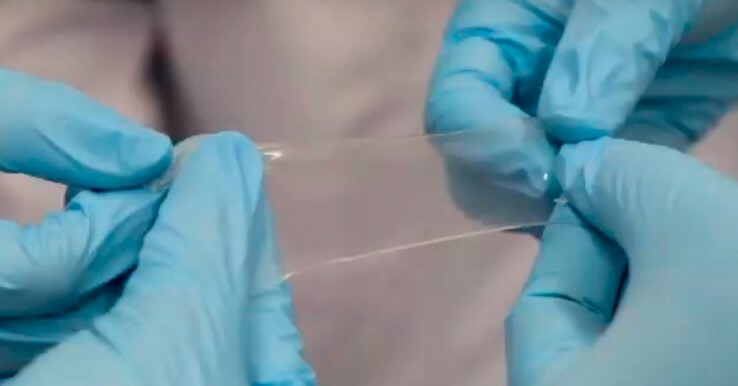 “One of the challenges with many self-healing materials today is that they are not transparent and they do not work efficiently when wet,” he said. In History Only One Man Had a Cure for HIV. How Is It Possible? Why Does Panama Monkeys Use Stone Tools for Breaking Nuts?